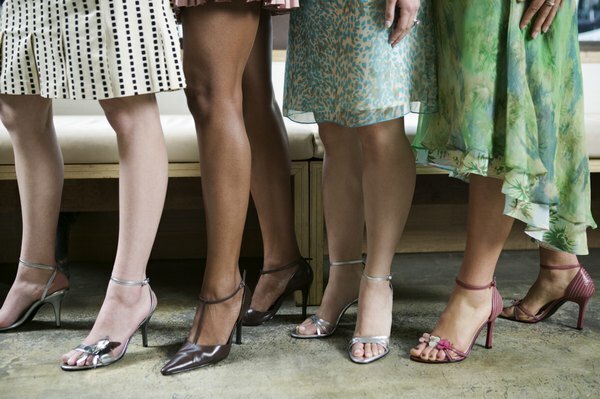 Can You Lose Weight by Wearing Heels? High heels alone won't get you the legs of your dreams. A great pair of heels can change your attitude and even your day, but women have long been warned of the risks of heels: back pain, foot damage, joint problems and issues with balance, to name a few. It would be nice if throwing on your favorite shoes proved to be the miracle cure for losing weight, but weight loss is hard work, and heels alone won't do the trick. Wearing high heels can, however, help strengthen the muscles of your calves. If you're hoping to lose weight, cardiovascular exercise is the queen of weight loss. While any movement -- even just the act of putting on heels -- can burn a few calories, cardio burns more calories than targeted toning. If you're hoping to get rid of excess fat in your legs, get regular cardiovascular exercise through running, cycling, jogging or jumping rope. Toning your muscles alone won't be enough, because without fat loss, your leg muscles won't be visible. High heels can play a role in shaping your calf muscles, according to a 2010 study published in "Biology Letters." The researchers found that a low heel -- 1.5 inches or less -- activated the gastrocnemius and soleus muscles of the calves more evenly than flats, improving muscle tone and strength. Heels can also alter body posture, making your muscles work harder to maintain an upright posture and strengthening muscles in the process. However, heels that are too high can have a reverse effect, weakening your legs and ankles. 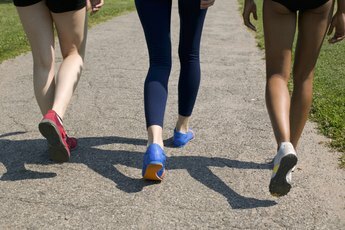 Whether you're walking barefoot, wearing flats or using high heels, you're using the muscles of your legs. High heels slightly alter the balance of your muscles, bringing the sides of your calves more into the picture, according to the "Biology Letters" study. The takeaway message is that, if you want to maximize the muscle-toning power of high heels, it might be best to alternate between several heel heights throughout the week. This way your leg muscles have to work in a variety of positions, increasing overall leg tone. A 2012 study published in the "Journal of Biomechanics" found that walking in heels changes gait and muscle control significantly, so wearing high heels all of the time can throw off your posture and balance. Extremely high heels can make it difficult to walk without tripping, increasing your risk of injuries, and constant heel-wearing can make walking flat-footed painful, according to a 2010 study in the "Journal of Experimental Biology." Stick to lower heels, and throw some flats into the mix. When you take off your shoes, take a few minutes to stretch your legs and rub your calves to ease tension and prevent pain.